Mexican sunflower is a tall and colorful annual, excellent for borders and foundation planting. Because of its large height and rangy habit, Mexican sunflower needs space. In full sun, it will bloom from June until first frost. Cut flowers last several days in water and retain their bright orange color well. Mexican sunflower is a member of the Asteraceae family. It is also known as tithonia. Mexican sunflower grows to a height of 5 to 6 feet. Most specimens are between 3 and 4 feet wide. Dwarf versions are also available that reach a height of only 3 feet. Numerous red-orange flower heads cover the plant. The flowers resemble daisies and are approximately 3 inches across. 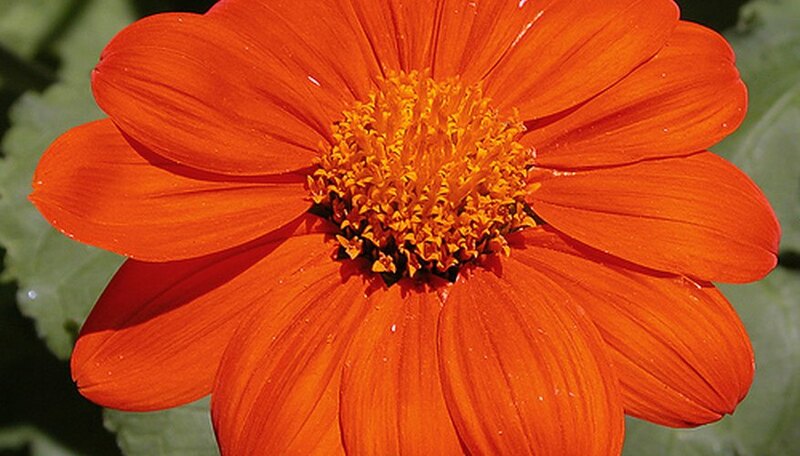 A native of Central America, Mexican sunflower is hardy in zones 5 to 10 where it will self-sew. If it is started from seed indoors, it can be grown successfully in zone 4. Full sun is best for Mexican sunflower, but it will grow and flower in filtered sun. Heat and draught tolerant, it prefers well-drained soil. Mexican sunflower attracts butterflies and can be used in fresh cut arrangements. Its stems are somewhat fragile and should be cut carefully to avoid damage. Locate this flowering plant in a warm sunny spot. It can also tolerate partial shade. Dwarf Mexican petunias are drought resistant but regular watering helps the plant thrive. Bees and butterflies are attracted to the flowers. Apply a fertilizer with high phosphorous content regularly. In January or after a hard freeze when the plant leaves become brown, cut the plant close to the ground as it goes into dormancy. The plants come out with deep green leaves in early spring and bloom all summer. Dwarf Mexican petunia self-seeds abundantly, so that sometimes it can become invasive in the garden. If you want, however, you can also propagate it through cuttings. Water to keep the soil slightly moist (the moisture in the soil should be similar to a well-wrung sponge) during the growing season. Allow the soil to dry out between waterings in the winter. Fertilize the Mexican pansy once a month during the growing season with a 10-10-10 fertilizer, at the rate suggested on the label for the size of your plant. Cut the stems back halfway after flowering and the Mexican pansy will rebloom. Sow Mexican sunflower seeds in the early spring after the final frost of winter. Choose a location that receives full sunlight and has soil that is well-drained, yet low in fertility. Mexican sunflowers cannot thrive in overly rich soils. Water Mexican sunflower seeds twice a day until germination occurs and seedlings emerge from the soil. Reduce watering to once a week, and only on weeks that don't receive at least 1 inch of rainfall. Feed Mexican sunflower using a balanced 10-10-10 NPK fertilizer immediately after planting to provide the nutrients required for initial growth. Fertilize again in July to encourage the plant to produce more flowers. Always follow the manufacturer's instructions for proper dosage and application of fertilizer. Remove dead or spent flowers as soon as possible to prevent Mexican sunflower plants from producing seeds. This will also encourage the plant to produce more blossoms in an attempt to propagate itself. Cut the Mexican petunia plants down to 1 or 2 inches above the soil level during the growing season. Dispose of all of the plant foliage in the garbage bag. Choose a day that is sunny, above 60 degrees and calm. Apply the glyphosate to the remaining stems of the Mexican petunia plants. Saturate the entire growing area thoroughly, but make sure you do not overspray any other planting areas. Monitor the Mexican petunia plants during the next three to four days. If you do not see obvious wilting and yellowing, reapply the glyphosate a second time to ensure you eradicate the plants. Grow Mexican asters from seeds by planting them directly into your garden. They tend to germinate in five to seven days when temperatures range from 70 to 85 degrees Fahrenheit. Mexican asters have blooming times that range from late spring through mid-fall. The blooms range in colors from pink to red to white with bluish green foliage that maintains a shiny texture. Parts of the Mexican aster are poisonous when ingested. Keep small children and pets clear of the growing flowers. Mexican asters grow to heights as tall as 48 inches and spread as they grow. Provide appropriate spacing to ensure that the asters do not begin to cluster. Space them approximately 18 to 24 inches apart. Water you Mexican asters regularly,even though they are drought tolerant. Avoid overwatering them. Plant asters in soil that is well drained. Butterflies are attracted to Mexican asters and use them as a source of nectar. Mexican Jumping Beans are three-sided "beans" that lurch and roll around when put in a warm or hot location. The "beans" are actually three-side carpals, or sections, of the seeds from a shrub called Sebastiana pavoniana. Some carpals contain larvae of Mexican Jumping Bean Moths ( Laspeyresia saltitans). When the larvae move, the beans jump. They will continue to move for weeks, and even months, if kept where they can receive air. Where Do Mexican Jumping Beans Grow? Mexican Jumping Bean plants grow in arroyos and on rocky desert slopes of Central and South America. Alamos, Mexico, is considered "The Mexican Bean Capitol of the World". The female moth lays eggs on the immature ovaries of the flowers on the plant in the spring. The eggs hatch and eat into the ovaries. The seed ripens in late summer and split, ejecting the carpals. The larvae live in the carpals until winter, when they spin cocoons around themselves. They mature into pupae and then into moths. They hatch out of the carpals the following spring or summer. Arizona Jumping Beans live in the seed carpals of the Jumping Bean Plants (Sapium biloculare). The plants live along rocky washes and slopes in Arizona, United States, as well as Baja California, Sonora and Mexico.